ABOVE: The Schloss Cecilienhof, once a royal residence, currently houses a museum and the Relaxa Schlosshotel Cecilienhof. Schloss Cecilienhof (a.k.a. Schloß Cecilienhof) was the last royal palace of Germany's Hohenzollern Dynasty. Wilhelm von Preussen, the son of Germany's emperor and the Crown Prince of Germany, had the house built from 1914 to 1917 and named it after his wife Cecilie. After World War I, when the royal family abdicated and surrendered most of its properties to the German state, Wilhelm negotiated the right to live in Cecilienhof with Princess Cecelie and their six children. The family stayed there until the end of World War II, when they left Potsdam as the Red Army advanced toward Berlin. 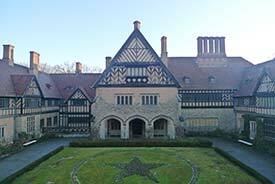 In 1945, the Allied powers chose Schloss Cecilienhof as the site of the Potsdam Conference, where Truman, Stalin, and Churchill negotiated Germany's postwar future. In the palace's museum, you can visit the conference room where the leaders of the United States, the Soviet Union, and Britain planned the Occupation. Following World War II, Schloss Cecilienhof was in the Soviet Zone and (after 1952) the German Democratic Republic. It served as an officers' club for the Red Army, a memorial site, and--from 1960 onwards--as a hotel. Today, the former state-owned hotel, which was intended to bring in hard currency from foreign visitors, has been replaced by the Relaxa Schlosshotel Cecilienhof, a four-star hostelry with 41 guest rooms and suites that shares the premises with the Schloss Cecilienhof Museum. Although the hotel's bathrooms, beds, and other furnishings have obviously been updated over the years, the Relaxa Schlosshotel Cecilienhof feels more like an old-fashioned country house than a hotel. You won't find Internet terminals or a concierge desk, but you can help yourself to free coffee and cookies in the lobby, have a pleasant meal in the wood-panelled restaurant, go for a walk along the Havel River, take your dog for a stroll in the palace gardens, or rent a bicycle to explore Potsdam. The Cecilienhof is a great place to unwind after experiencing the hustle, hubbub, and hipness of nearby Berlin. Schloss Cecilienhof is 2.5 km or about 1½ miles north of Potsdam's town center in the New Garden district, an area of lake- and riverfront parks and villas that's easy to reach by public transportation, bicycle, or car--or on foot, if you don't mind a reasonable walk. For more information about the hotel, visit the Relaxa Schlosshotel Cecilienhof Web site. To learn more about the palace and its museum, see the Prussian Palaces and Gardens Foundation's Cecilienhof Palace page and the Potsdam tourist office's Schloss Cecilienhof visitor information. Finally, to see more captioned pictures of Schloss Cecilienhof and its surroundings, go to page 2 of this article.